A few weeks ago, Ashley and I had a really cool day . . . we went to Lancaster and we started AND ended our day at Chick-fil-A. 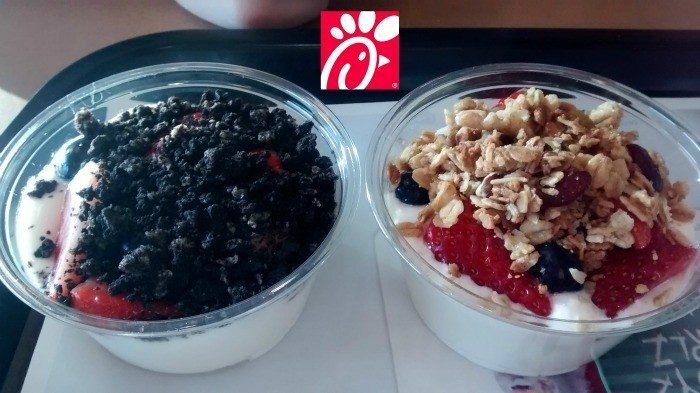 As part of the Chick-fil-A Mom Panel, I had received a coupon to try the Greek Yogurt Parfait for free. So, when we went for breakfast, we each got a Chicken Biscuit (check back next week!) and a Greek Yogurt Parfait. We had to try both, of course, so Ashley got the one with granola on top and I opted for the cookie crumbs one. They were both filled with plenty of yummy fruit (strawberries and blueberries) and the toppings make them extra delicious. It’s just a small portion, so it’s a nice complement to a larger breakfast; but it would also make a great pick-me-up around mid-morning. ← Join in my Dream Disney Scents Launch Party!